You can post comments and mentions to a roadmap item using the Activity tab in the item card. 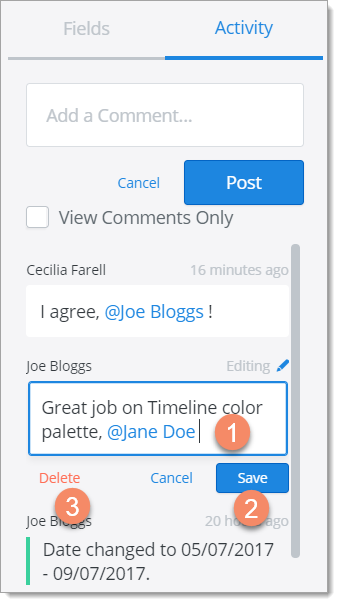 You can also view comments posted by other users, and edit and delete comments you've posted. To open the item card, click the item in a Timeline or Swimlane, or click Description in the Items Table. 1. In the item card Activity tab, click inside the Add a Comment text box and type your comment. To mention someone in the comment, enter @ and start typing their name. A popup with matching names appears for you to select the right one. 2. When you're done, click Post. Your post gets added to the item Activity Feed below, together with item activity and other comments. If your post contains a mention, the user gets an email notification. Anyone with access to a roadmap can view comments and mentions posted to any of its items. If it's difficult to find and read comments in the feed, you can filter out item activity by selecting the View Comments Only checkbox. 1. To edit your comment, click inside the comment text box and make the changes. 3. To delete the comment, click Delete. Who can post and view item comments? Anyone who has access to a roadmap can post comments to any of its items. That includes the roadmap's Owner, and any other user who shares the roadmap either as an Editor or a Viewer. In other words, even if you have view-only access to a roadmap, you can still post comments and mentions to any of its items.